The scenario for this battle, using Pulse of Battle rules by Brent Oman was covered in the previous blog post. Barry opted to take the Romans, and I hardly needed to suggest to him that the possibility that Hannibal had something up his sleeve! I took the Carthagenians, obviously, and won the first dice off for impetus, and opted to go first. I turned a MOVE card fairly early, and despite my more talented commanders, I still managed to roll a "1" with my right center command. OTOH, I rolled a Double move with my left flank Cavalry AND the left center Infantry/Elephant command. On Barry's initiative, he drew a MOVE ONE COMMAND card, and used it to answer my moves with his right flank Cavalry command. Barry later drew a MOVE card, and rolled a "Triple Magic Move" with the same cavalry command, and the Italian Allied cavalry charged home on Hannibal's Spanish and Gallic troopers. The melee against the heavier armored Gauls resulted in the repulse of the Italian cavalry (and their attached leader , who gives an Up 1 in Melee), down one UI and Disordered. Unfortunately, the Gauls pursued thus advancing 2" but also losing a UI, so a relatively indecisive result. The Spaniards and their own Italian adversaries promptly both rolled 3's in Melee combat, having no effect upon one another, but ending the melee for the time being (if both side roll ODD in any round, the melee stops for them for that card - a significant change from FoB, which tends to make melees last longer, which seems appropriate for the era). Both sides made the most of their TACTICAL ADVANTAGEs in the melees. When the Initiative shifted to me, I eventually drew a MOVE ONE COMMAND card, and used it for my left flank cavalry; their commander rolled a Double Magic Move. My Elite Numidian horse maneuvered for a flank shot of javelins into the Italian Allied cavalry.... and missed (as they started to the front of the Italians, even if they hit them in the flank, it would NOT have counted as a Flank melee). In disgust,the Gallic cavalry charged into the same unit of Italians, a melee in which they would have a slight advantage - and were utterly crushed in the resulting combat (hot dice by Barry)! That is Bomilcar looking rather exposed after his Gauls did the "Shuffle off to Milano"! Shortly thereafter, The Carthagenians drew an ARMY MORALE card; as Bomilcar's command had at least one unit that had taken hits or been in Melee since the last card, he had to roll a D12 for survival, and rolled a ONE! "Arrrrgh! and assorted Punic curses filled the air as Bomilcar was placed hors de combat! this would leave his command unable to move until a replacement could be appointed by Hannibal. Note the "arrow volley" marker (by Litko) indicating that the LC have chucked their Javeklins, and must wight for the next "Missile Combat" card to "reload" so nthat they can shoot again. The next card turned by the Sons of Carthage was... LEADERSHIP! "Hello, I'm not really dead, I was just restin!" A new right wing commander duly appointed, although he rolled up one level worse than the original. Further MOVEs by both sides l;eave those Italian Allied cavalry looking very vulnerable as both the Elite Numidian LC and the Crack Balearic Slingers shoot at them... and once again inflict no discernible damage. "Must be the Immortals.... no, wait, weren't those guys Persians?" The Romans have managed to move up the entire IV Legion and the supporting Gauls on the Northern end of the field (whose loyalty was possibly somewhat suspect). In the center, both sides had had a run of cold Leadership dice, the Carthagenian right center command in particular rolling two "1's' in a row! "Alright, Hanno, that's quite enough rubbing oil on Agbal! We're Poeni, not Pubi, and we got a battle to fight, ladies!" The Roman Knights had managed a similar feet of two failed MOVES in a row, and to make matters worse, the THWACK ("Hypothermia") card had been turned by the Romans - not the meany "chicken" markers on the Romans in the preceding picture and this one. Far too homophobic to rub oil on one another against the cold ("That's for those effeminate Greeks, eeeeew! "), the Equites seem to be trying to keep warm by staging a pig roast, as Severus longus looks for his portion! Both side finally get their lagard commands caught up with double MOVES - the battle lines are all nice an even now, like they planned it that way! Euclid would be proud! The SPECIAL EVENT ("Weather Worsens" card is turned by Rome, and it starts to Rain! All missile fire is Down 1. This hurts Carthage much more than it does Rome, I'd say. while the Roman Allied hairy Gauls use a MELEE card to charge the Elephants, and the Spanish cavalry add to the odds against the beleaguered Italian cavalry. The main infantry battle lines are closing with another, and hail of Javelins fly, large having little effect. The Elephants repulse the Gauls, while the Italian Cavalry perform prodigies of valor, defeating both of the opposing Carthagenian cavalry units. Overview of the battlefield at this point, looking South to North. the Carthagenian Spanish Scutarius units have charged the more lightly equipped Velites, driving them back with losses. Roman Republican Infantry units can freely interpenetrate one another, to reflect their reported ability to withdraw and reinforce units along the line of combat. A subtle, simple but neat and effective special rule for them! The Roman Knights finally finished their weenie roast, and have moved forward grudgingly to support the open flank of the I Legion. Hannibal turns a MOVE card, and springs Mago's ambush - a unit each of mediocre Numidian Javelinmen ("Peltasts"), and one of the dreaded Numidian Light Cavalry appear to the flank and rear of the flower of the Roman Patrician class! "Punic Faith!" they scream. "I told you the Romans have no eye for Stratagems", remarked Hannibal to Gisgo. View from the Northern end of the field at this juncture; the Gauls have charged the Elephants again, while the Velites have engaged the African Javelinemn. A Carthagenian MANEUVER card allows the Ambush force to home in on the flank of the Roman Knights, wile Sempronius Longus looks on. Not to be outdone, the Romans turn their only MANEUVER card as well. The Triarii of the Reserve turn to face Mago's rear attack... as do the Roman Knights. A Roman MOVE card and a Double Magic Move roll later, and the Knights prepare to stick it to the supposed Ambush. The Numidian "Pelttsts" are wiped out. "Now see here you rude blighters; it's not nice to bust in on me an my mates when we're hanging out all macho like at the barbie, now is it?" The Insubrian and Boeii Gauls use a WARBANDS CHARGE card to charge the front line of the III Legion, composed of Hastati. "Let's stick it up, em, Bois!" Meanwhile, the Ponderous Pachyderms have thoroughly enjoyed stomping on the renegade Gauls that charged them - they are shattered, losing 3 UI and being thrown into severe Disorder (note markers). "I do love the squishy feeling of tenderized Gauls between my toes; how about you, dears?" At this point we had played completely through both decks, ending the turn. We had played for about 2.5 hours, making fairly frequent reference to the rules. As Barry was due to take the Czarina out to dinner shortly, we stopped play at this point. I will finish the battle solo this weekend; that will be reported in part 2! 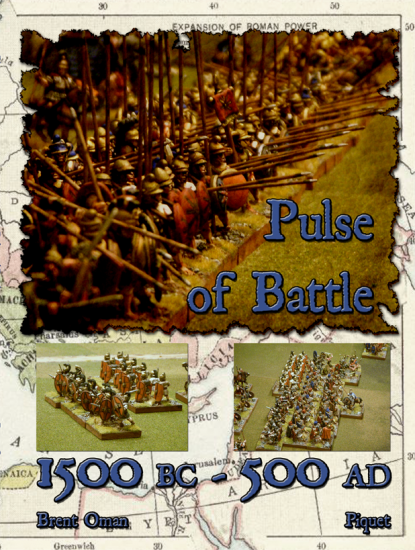 Pulse of Battle is the new set of wargame rules for Classical Ancient Warfare, 1500 BC to 500 AD by Brent Oman and Piquet, Inc. Pulse of Battle is derived from Brent's own previous Field of Battle, 2nd edition rules. I will have much more to say about Pulse of Battle over several posts, culminating in a review of sorts (similar to the one I did for Field of Battle itself) , but one thing the rules didn't include was an introductory scenario. With Barry due to come over for a game in 2 days, I needed to come up with a scenario quickly. So, I turned to an old favorite, also from Piquet, Inc, Glenn Pruitt's wonderful 2nd Punic Wars scenario book for the earlier (and still perfectly good) Archon Piquet ancient rules, "Hannibal ad Portas". Thumbing through the ten scenarios in HaP, I chose The Trebbia, which was fought in December of 218 BC in the Po River valley, not long after Hannibal's initial crossing of the Alps that Autumn. The terrain and scenario are fairly straightforward, although of course in any battle involving Hannibal there's going to be a twist somewhere, eh? The playing space for the battle is essentially a 6 foot long by 4-5 foot deep table with the River Trebbia flowing along one edge. The rest of the table is an open field (or apparently so...), with the Romans having been goaded by Hannibal's' skirmishers into crossing the river to attack his Army. The day was cold and cloudy, and the river chilly. This would result in the wet Romans gradually suffering hypothermia, although the Carthagenians will not be immune either if the weather turns foul, although Hannibal had his troops oil their bodies as partial protection form the cold and wet. The first step to adapt the scenario from Hannibal ad Portas, which incidentally is now available as a PDF from Brent (Piquet) for only $15 ($1.50 per scenario - super cheap! ), was to convert the troops and ratings form those used in Archon to those used in Pulse of Battle. PoB is a pretty top down approach to Ancient warfare, focusing on the role of various troop types and the friction of battle and command much sore than the individual variations in weapons and armor. It is NOT a "Rock/Paper/Scissors type design at all. Again, I will return to discuss these issues in a review in the near future. * some names are fictitious, and P.C. Scipio was not present in fact, as he was recovering from his wounds suffered in an earlier action. Glen's scenario \calls for a "Hypothermia" card to be added to the Roman Sequence Deck. In his scenario, when it appears, all Romans are Down 1 for Melee for the rest of that turn. We used the FoB "Thwack!" card, and upon its appearance, all Roman units must roll their Defense Die against a D8; if they fail, they are Disordered no effect if they are already Disordered). Having played the scenario now, I'd go back to Glen's original idea and just make all units affected Down 1 in Melee for the rest of that Turn. The scenario also called for a "Weather Worsens" card to be added to the Roman deck as well. We used the PoB "Special Event": card for this. On its first appearance, it starts to rain and all Missile fire is Down 1. On the second appearance, it starts to sleet; both armies then add another Thwack/ Hypothermia Card to their decks (making 2 for the Romans and one for the Carthagenians total). On a 3rd appearance, it starts to snow; all Cavalry and Elephants are Down 1 in Melee, and all Command Radii are reduced 4". Finally, we added a PoB "Warbands Charge" optional card to both Sequence decks; this card effects only the Gallic Warbands in this game. The Roman set up from the South ; note the "Alps" to the North, used for effect (and to hide the gaming junk on the far end of the table, LOL). The far tree lone and near line of fields are strictly decorative and are used to delineate the playable table area. The Romans start up 0 to 12" from the West bank of the Trebbia, but not within 8" wither side of the Northern or Southern edges - the "rocks" demarcate the Set up area. View of the Carthaginian deployment from the South; the rocks again mark of the Set up area, from 4 to 14" of the Western table edge, excluding the 8" either side of the Northern and Southern table edges. Note the (very well done) Custom Pulse of Battle Sequence deck, and gold coins (Morale Points), as well as the "Carthagenian Purple" polyhedral dice! Carthagenian Setup from the North, looking South. Center of the Roman set up - 4 Legions side by side, Velites in front, Hastati in the second rank, Pinceps in the 3rd rank, and Triarii in Reserve. Roman Deployment from the North, looking South. Center of the Carthagenian line; note the Ponderous Pachyderms! The next post will cover the first Turn of the battle (a Turn is a long time in Pulse of Battle, representing up to 2 hours of fighting). Hail Oman! Salutant vos, qui pugnaturus sumus!